The Royal Parks are hosting a series of events that is demonstrating the link between two of the most celebrated aspects of leisure provision: literature and open space. Eight writers have been commissioned to produce short stories inspired by one of the Royal Parks and public readings are being held in the parks over the summer. Rowan Routh, who edited the series, explained that the Royal Parks have made frequent appearances in literature, with Chaucer, Virginia Woolf, Charles Dickens, Henry James and Sylvia Plath all using the parks as locations. “This series is a great way to celebrate both the literary heritage of the parks and the short story,” she said. “There’s a kinship between parks and short fiction – both confined things but no less for being so. They’re perfectly matched to be enjoyed together.” Author Clare Wigfall opened the season of readings in St James’s Park with her story of intrigue and exotic aviaries set in 1664. “The Royal Parks are bursting with stories,” she said, “so it was an absolute pleasure to be commissioned to write on a subject so inspiring, that from the very outset ideas were already sparking like fireworks in my mind. I chose to write about St James’s because it was a park I could visualise well from my Berlin study but it was the day I spent wandering in its grounds with the park keeper that saw the blossoming of my story, Along Birdcage Walk. The park keeper mentioned the gilded cages of exotic birds that used to line the avenue in Charles II’s day and this was an image so beautiful and evocative I knew that I wanted to bring it again to life through my fiction.” The full list of authors taking part comprises: Nicola Barker (Greenwich Park), William Boyd (The Green Park), Shena Mackay (Richmond Park), Will Self (Bushy Park), Ali Smith (The Regent's Park), Adam Thorpe (Hyde Park), Clare Wigfall (St James's Park) and Hanan al Shaykh (Kensington Gardens). The readings are free and copies of the stories are available at a cost of £2. A survey of how the public perceives their local area brought some predictable headlines in the national press and some interesting reading for leisure professionals. Place Survey: England 2008 was published by the Department for Communities and Local Government (DCLG) in June to provide “information on people’s perceptions of their local area and the local services they receive”. The survey, the first of its kind carried out by the DCLG, put the City of London at the top of the ‘satisfaction league’ but the City’s tiny resident population allowed Richmond upon Thames to claim the ‘best place to live’ title with a 92.4% approval rating of local services. When Richmond Council were asked to comment, their statement put their success down to a low crime rate and green spaces. In the City’s case, residents pointed to a seven-time-a-day street cleaning regime and the Barbican arts centre as leading attributes. Further down into the detail of the report a national aggregation of responses showed 69% of respondents satisfied with their parks and open spaces, and 69% satisfied with their libraries. However, sport and leisure facilities drew a 46% satisfaction rating, with theatres/concert halls at 43%; museums and galleries came in at a lowly 41%. The assessment of the survey’s data noted that the response rate was low (less than 30%) and that “some caution may be necessary when using the results to set performance targets” but the figures will still provide food for thought for leisure services around the country. Despite nothing official from their Leeds headquarters, it seems that Sportscoach UK are in the extended throes of parting company with group chief executive officer, Pat Duffy, after nearly four years. Details of the imminent departure have been an open secret for a number of weeks and when asked for a substantive comment the Sportscoach UK press office said the company had “nothing to contribute” and we should direct our enquiries to Helen Davey, listed on their website as UK Coaching Framework programme and policy director. Sport England has launched an independent inquiry into the appearance of an apparently unauthorised payment system that has had access to £20 million of Sport England funding. The World Class Payments Bureau apparently came to light in the last weeks of 2008 when the Sport England accounts department informed the chief executive, Jennie Price, of the existence of an account that had received funds totalling £19.7 million. The account, which had previously been used to make supporting payments to small governing bodies of sport, had last been used a few days before Price took up her post March 2007 and, having been made aware of the account’s existence, Price immediately closed the account and set up an investigation. Sport England has commissioned Tim Dutton QC to lead the investigation and the report will be made to the chair of Sport England and Sport England’s funding department, the Department for Culture, Media and Sport, this autumn. Sport England has confirmed that the account had operated “outside the usual financial controls of the organisation” and had not been included within the organisation’s audited accounts. It also confirmed that the account had been dormant since March 2007. West Sussex firm Tracmaster Ltd -- known across the horticultural industry for the reliability and performance of its ground care machines [That’s enough. Ed.] – is marking 25 years of successful trading from its base in Burgess Hill by launching a competition to win one of their best-selling products, the Camon C8 rotovator, worth over £2,000. Anyone can enter via their website www.tracmaster.co.uk and the closing date is 31st August. The anniversary has also acted as a catalyst for the recruitment of fifty new authorised dealers in the UK and Ireland and the launch of three new products: a hydraulic rotavator, a multi-purpose tiller and a new portable twin-chute chipper-shredder. Australia has retained its status as Commonwealth Pool Lifesaving Champions, fending off stiff competition from Canada and South Africa. The men who run rugby league in Australia have called for clubs to actively promote women into more senior roles, including board positions. They are “strongly of the view” that there are a large number of women in corporate life who could add real value to rugby league clubs at a Board level as well as in administrative roles. Chief executive David Gallop said: “It is important going forward that the make-up of Boards in some way reflects the fact that almost half the game’s fans are women and that an increasing number of women are involved in administration and game participation.” For the second year running Benton Hall Golf and Country Club has won the club of the year award in the 4,000-plus members category at the FIA FLAME Awards 2009. Pulse Fitness is delighted to announce that Salford City Council and Salford Community Leisure have agreed a five-year partnership deal with Pulse to supply fitness equipment and supporting services across all its sites. Titian’s The Triumph of Love, acquired by the Ashmolean Museum, Oxford through the Acceptance in Lieu scheme, is to be exhibited in Room One of the National Gallery following its recent rediscovery and cleaning. Last exhibited in 1960, the painting’s true quality was obscured by dirty varnish and overpaint, leading to doubts being cast on its authorship. Capita Symonds’ countryside management team has launched a new mountain bike trail design service in conjunction with internationally renowned mountain bike course sculptor Phil Saxena and specialist contractor Dinsdale Moorland services. Capita Symonds has also been successful in securing £3.9m of capital funding on behalf of Warrington Borough Council for a new 14-19 diploma centre within the £30m Orford Park project. A blue plaque commemorating Sir Douglas Bader has been unveiled at 5 Petersham Mews in Kensington, London. Shokk has announced its fourth site in association with Holmes Place, Portugal. Sports minister Gerry Sutcliffe has announced the creation of a new voluntary funding arrangement to bring in at least £15 million over the next three years for the research, education and treatment of problem gambling; a new body, the Responsible Gambling Fund, has been set up to distribute the money. The latest communities and local government secretary, John Denham, has pledged to re-examine the relationship between central and local government as part of the government's drive to renew Britain’s democracy and restore trust in the political system at every level. Boris Johnson has unveiled a new council to promote and rebrand London, the imaginatively named Promote London Council. The council is charged with creating a more comprehensive and joined-up approach to promoting the capital, particularly in the run-up to the London 2012 Olympic and Paralympic Games. The ‘big build’ of the international broadcast centre and the main press centre is apparently on track now that plans have been approved by the Olympic Park planning committee. The London 2012 Open Weekend (24 – 26 July 2009) promises a series of events across the country “enabling access to excellence in the arts, culture and sport and celebrating three years to go until the London 2012 Olympic Games”. The Olympic Delivery Authority (ODA) has confirmed final agreement for the Triathlon Homes joint venture company to purchase 1,379 affordable homes on the athletes’ village development. The Nielsen Company has become official market research services provider to London 2012 and Holiday Inn and Holiday Inn Express are now the official hotel services provider. Ten percent of construction workers working on the Olympic Park are walking or cycling to work, as the ODA continues to work towards getting 5% of spectators walking or cycling to events for London 2012. Information outlining plans for temporary controls to street trading and advertising in 2012 has been published. Irene Lucas, leisure stalwart and chief executive of South Tyneside Metropolitan Borough Council since 2002, has been appointed to the post of director general for local government and regeneration within the Department for Communities and Local Government. David Prout, executive director for planning and borough development for the Royal Borough of Kensington and Chelsea, has been appointed director general for communities in the same department.The National Skills Academy for Sport and Active Leisure has appointed Florence Orban as its CEO on a permanent basis. Baroness Kay Andrews has been appointed as the new chair of English Heritage. NEW WATER BABY: Steve Franks (right) has joined Water Babies Ltd as the company's new managing director. 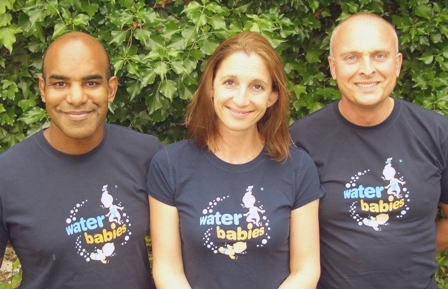 Water Babies was founded in 2002 by Jess and Paul Thompson (centre and left)and has grown to become the UK’s leading commercial baby swimming company. 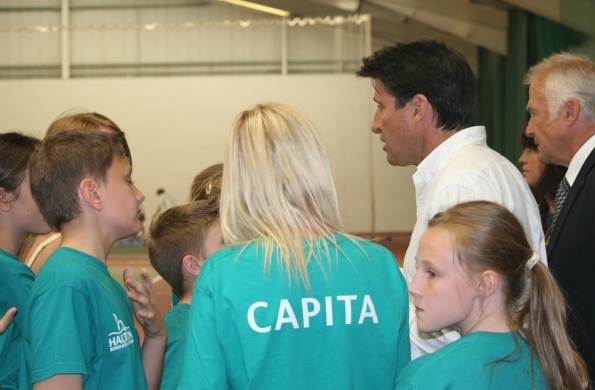 2012 COMES TO MERSEYSIDE: As part of the drive to promote the concept of legacy, Seb Coe visited the Merseyside Primary Games which in one form or another has been going for the last eighteen years. He saw 1,200 young people taking part in ten sports.